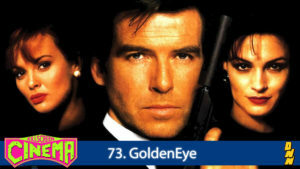 One of the most successful and iconic video games based on a movie is arguably GoldenEye 007 for the Nintendo 64. So we figured we would reverse I normal criteria & discuss the film that inspired the game. We’re joined in this self-indulgent besmirching of our sacred podcast bylaws by seasoned guest, comedian/musician Jake Reber, who stops over to promote the upcoming 8th Annual Carney Award for Comedic Excellence.